ATI Tray Tools always will be FREE, but if you think ATT is valuable and wish to express your appreciation, I do accept and appreciate monetary donations. Your support will keep this project alive.Artifact Tester with ability to find maximum stable clocks for GPU and Memory.OpenGL settings with templates, GUI form and tray popup menu.Direct3D settings with templates, GUI form and tray popup menu.Hardware tweaks. Setting PCI latency timer. ...... Tester with ability to find maximum stable clocks for GPU and Memory. * Game profiles with desktop shortcut creation. 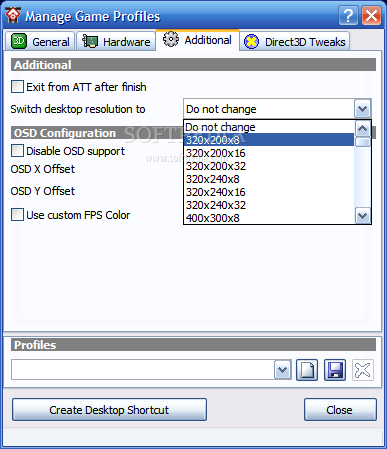 * Refresh Lock system with ability to set separate refresh rates for each resolution. * Speed improvement tweaks for Anisotropic/Trilinear Filtering. Support for Catalyst A.I. Qweas is providing links to ATI Tray Tools 1.7.9.1526 as a courtesy, and makes no representations regarding ATI Tray Tools or any other applications or any information related thereto. Any questions, complaints or claims regarding this application ATI Tray Tools 1.7.9.1526 must be directed to the appropriate software vendor. You may click the publisher link of ATI Tray Tools on the top of this page to get more details about the vendor.